Kaytee Aspen Bedding & Litter is manufactured with all natural aspen shavings specially processed to eliminate dust and wood debris found in other bedding. Aspen bedding comes from hardwood, eliminating aromatic oils found in other types of wood bedding. Kaytee Aspen Bedding &amp; Litter is manufactured with all natural aspen shavings specially processed to eliminate dust and wood debris found in other bedding. Aspen bedding comes from hardwood, eliminating aromatic oils found in other types of wood bedding. Red Cedar cleaned and filtered to eliminate dust, naturally helps keep fleas &amp; insects away, great natural aroma. 100 percent aromatic cedar reduces pet odors. Fresh, clean, natural shavings. Soft and absorbent. Dust free. Excellent bedding for dogs, cats, guinea pigs, gerbils, rabbits, mice AND other small pets. Soft Granule Blend is made from wood fibers that are not suitable for paper production. Rather than be discarded, the fiber is converted into a soft, highly absorbent form that provides a great cage environment for small animals, birds and reptiles. Kaytee Soft Granule Blend Small Pet Bedding Lavender 10lb. Lavender Naturally Scented Bedding with a genuine herbal ingredient adds a gentle, soothing scent to your small pets habitat. KAYTEE Soft Granule Blend is made from wood fibers that are converted into a soft, highly absorbent bedding and litter. Kaytee Natural Pine Bedding and Litter is manufactured with all natural pine shavings specially processed to eliminate dust and wood debris found in other beddings. The natural pine oils help suppress microorganisms and provide a clean, fresh aroma. 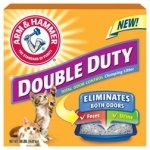 Arm and Hammer Cat Litter Deodorizer eliminates litter box odors with the power off Baking Soda. The Moisture Activated Fragrance makes it the most popular deodorizing product for cat litter boxes. Critter Litter is a premium-quality potty training material for training ferrets, rabbits, pet rats and other small animals. It is specially formulated to be 99% dust-free and is super absorbent. Made from all natural non-toxic bentonite. Critter Litter absorbs moisture on contact and inhibits the bacteria that cause pet waste odors. In combination with a potty training program, Critter Litter will reduce cage cleaning. Critter Litter is a premium-quality potty training material for training ferrets, rabbits, pet rats and other small animals.It is specially formulated to be 99% dust-free and is super absorbent. Made from all natural non-toxic bentonite. Critter Litter absorbs moisture on contact and inhibits the bacteria that cause pet waste odors. In combination with a potty training program, Critter Litter will reduce cage cleaning. All natural and environmentally friendly.100% Bentonite. 99% dust free cat litter with less tracking. No fillers added to litter which creates an extra hard clumping action. Freshly scented formula is perfect for multi-cat households. 100% natural source ingredients. NEW! Total Odor Control Clumping Litter. Instantly eliminates BOTH urine and feces odors on contact! Dust Free, Low Tracking and Fresh Scent. The more cats you have, the more you need the extra-strength odor-blocking protection of Arm and Hammer Multi-Cat Strength Clumping Litter. Multi-Cats activated baking soda crystals absorb even the toughest odors and our most advanced clumping technology makes scooping a snap. Multi-Cat keeps cats coming back to the box no matter how many paws are in the litter. Power of Arm and Hammer Baking Soda. Destroys odors on contact. Clumps hard and fast to lock in odors. Advanced clumping system to remove the source of odors easily, no crumbling just remove wasteno need to completely change the litter each time. Fresh scent. 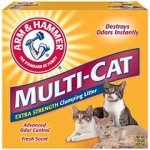 Arm and Hammer Super Scoop Clumping Cat Litter Scented with Baking Soda is the No. 2 best selling litter in the scoop-able segment. Each Arm &amp; Hammer Ultra Last granules are coated with odor-neutralizing Baking Soda. 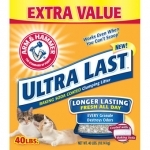 Arm &amp; Hammer Ultra last is fortified with powerful, proprietary malodor counteractants that stop litter box odors. This potent combination provides immediate and lasting odor protection - even if the litter box is not scooped for a day. 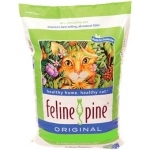 Feline Pine Natural Cat Litter. Natural pine destroys odors without perfumes or additives.